We have partnered with Michigan Works to provide training to ensuring women are prepared to succeed in a 21st century changing economy is critical to the financial stability of women, their families, and our country. WHY IS GREEN GOOD FOR WOMEN? The growing green economy is creating new opportunities across the country, industries, and educational levels. Green companies need women who can design, build, install, retrofit, lead, and much more. Many green jobs have high wages and good benefits. Why not explore a rewarding career path that will provide family-supporting wages and benefits such as health care and paid leave? Reason 1: A green job can provide the chance to earn more. Many of the jobs that are considered green are jobs that women haven’t traditionally held. As a result, women miss out on earning good wages and benefits. For instance, green jobs in environmental engineering pay a median wage of $37.04 an hour or $77,040 a year. The position of environmental engineer was projected to be among the fastest-growing occupations from 2008 to 2018, with an expected 31 percent job growth rate. Construction carpenter is a green occupation projected to have 325,400 job openings from 2008-2018.Carpenters, 98 percent of whom are men,earned a median wage of $18.98 an hour in 2009. In contrast, preschool teachers, 98 percent of whom are women,18 earned $11.80 an hour.19With these wages, a preschool teacher would have to work 24 more hours per week to earn the same amount as a carpenter. Reason 2: You can start with any skill level and move along a career path. stone to improve your skills and move you toward your ultimate career goal. The skills you acquire in an entry-level job can advance your career. You will acquire stackable credentials and portable skills. Reason 3: Green jobs appeal to workers with diverse skills and interests. Recycling coordinators supervise recycling programs and facility staff and volunteers. They also set collection schedules, track materials, give presentations, and develop budgets. Home insulators install materials to prevent energy loss, reduce noise, and ensure safety. They do this by covering pipes and insulating walls. Reason 4: Green jobs can give you greater satisfaction. When you take a green job, you become part of an important effort to protect and restore our environment. Whether you help reduce energy usage, greenhouse gas emissions, or water consumption; conserve natural resources; or minimize waste and pollution, you can take pride in knowing that your work is contributing to the health and sustainability of life on our planet. Reason 5: Green job opportunities are available for workers of any age. Green jobs are for those just starting out and those in need or want of a career change. Federal funding is currently spurring an increase in green jobs training programs that offer opportunities for younger workers to get started and for more seasoned workers to use their skills in new ways. Reason 6: Green employers are looking to hire. Reason 7: There are multiple ways to get started in a green job. There are a variety of ways to gain the initial skills you need to be part of the green economy. You don’t have to go to college to get a green job, but a college degree can increase your job opportunities and earning potential, and is necessary for some green jobs. Green job training ranges from on-the-job work experience to paid apprenticeship programs to certification programs sponsored by independent, professional organizations. Electricians, for example, can begin their training with a high school or vocational education, and then go on to a community college, trade school, apprenticeship, or certification program. Our job training is offered to men also. Over the past several decades, women have been entering nontraditional jobs and experiencing the exciting career opportunities and greater earning potential these jobs offer. Yet many occupations in green industries remain relatively untapped by women looking to earn a family-supporting wage. Though these occupations remain nontraditional, don’t let the unfamiliar stop you! Green jobs offer a broad set of opportunities from which to choose. Explore your options and choose a green career that can provide the future you want. Ensuring women are prepared to succeed in a 21st century changing economy is critical to the financial stability of women, their families, and our country. 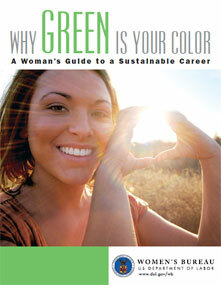 Why Green Is Your Color: A Woman's Guide to a Sustainable Career is a comprehensive manual designed to assist women with job training and career development as they enter into innovative and nontraditional jobs. The guide also provides vulnerable women a pathway to higher paying jobs, and serves as a tool to help fight job segregation.